Absinthe, Green Fairy, Green Muse, Goddess... The absinthe drink has many names. It also has a fascinating history, romantic connections to the avant-garde art scene, supposed mind-bending effects and -- of course -- a great taste! 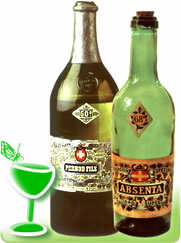 Absinthe, that green blast from the past, is once again grabbing the attention of pleasure-seekers across the globe. With her unique blend of taste, freedom and old-style elegance, the Green Fairy has come back with a bang. There is more to absinthe than thujone or Van Gogh's ear. Absinthe Fever aims to be your ever-growing, reliable and fun guide through the curious world of the Fairy with green wings. What are the so-called absinthe effects? Is it thujone, or just the alcohol? Got something to say? We have an open forum! In fact, the whole of Absinthe Fever works as an open forum, because anyone can post notes, thoughts or opinions to any page on the site. Every article on Absinthe Fever is intended as a topic for further discussion -- so join us and have your say! Because we are so feverishly passionate about absinthe, the drink that rewrote history, inspired great works of art, even fuelled rebellion and dissent... A truly fascinating creature, the Green Fairy, don't you agree? "What a superb web site! Cheers, and keep it up!"